Welcome to newest AmeriCorps Project Conserve member! 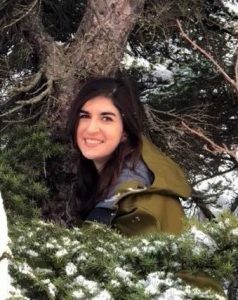 We are excited to be welcoming our third AmeriCorps Project Conserve Associate to the Hemlock Restoration Initiative team! Hanusia Higgins was born and raised in central Pennsylvania, where the state tree is the eastern hemlock. She recently graduated from Washington University in St. Louis with a bachelor’s degree in biology, ecology and evolution and a minor in environmental studies. Hanusia is especially interested in invasive species management, so she’s thrilled to be serving as the HRI Stewardship and Volunteer Engagement Associate through AmeriCorps Project Conserve. In this role, she is looking forward to working hands-on to conserve the hemlocks of western North Carolina and getting to know the local community. When she’s not picking up plastic bottles and muttering to herself about recycling policies, Hanusia enjoys cooking, baking, biking, and hiking. Project Conserve is a National Service program in which members come from across the nation to dedicate themselves to serving critical environmental and community needs in western North Carolina through service positions. Members are selected based on skill, education, experience, passion and commitment to service. Project Conserve was founded in 2004 as an initiative of Conserving Carolina (formerly Carolina Mountain Land Conservancy) to respond to the growing conservation needs in western North Carolina. The program focuses on collaboration with nonprofit organizations, community groups and local governments to provide service throughout the region.